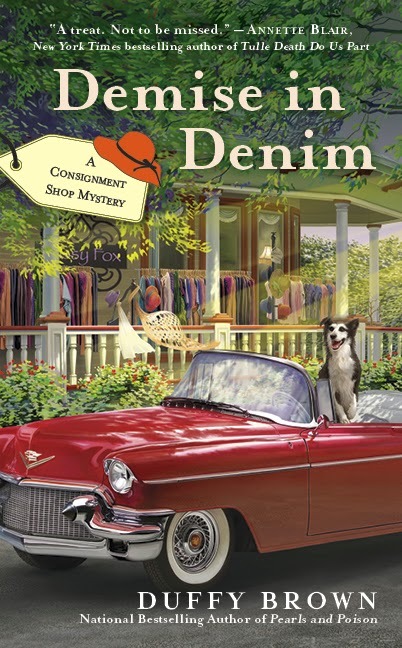 Duffy Brown, author of the Consignment Shop and Cycle Path mysteries, is joining us today on the MRM blog to celebrate the release of her latest book, Demise in Denim. 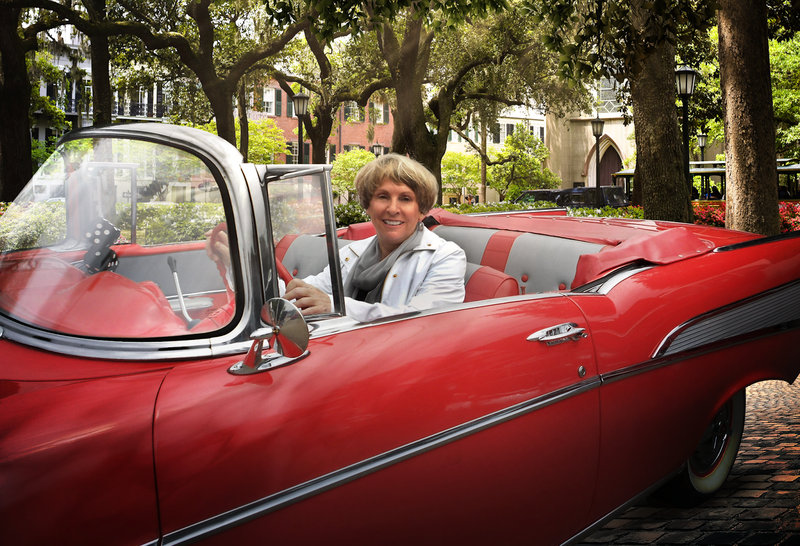 We are pleased to be part of the celebration and to share Duffy's view of Savannah, the setting for the five Consignment Shop mysteries, as well as a giveaway from Duffy. Don't forget to comment and enter the giveaway at the end of the post! New York is the place to set a book on fashion or finance, LA is the best setting for stories about the movie industry, Nashville gets the nod for stories about music, New Orleans has their vampires and Savannah is the perfect setting for a murder mystery series. Savannah is a city where the spirits of the long ago departed still linger in sultry streets and moss-drenched cemeteries. Okay, even if you don’t believe in ghosts the homes, B&Bs, restaurants, bars, town squares where people met their end are still there. The city is built upon its dead. Savannah's Historic District is the largest in the country and you cannot walk more than two feet without passing over a dead body because Savannah's dead aren't just in the cemeteries. Hundreds of victims of the Yellow Fever epidemics of the 19th century lie in mass graves that were never marked. In 1820 there was a huge fire that burned over four-hundred homes. Many of the homes were rebuilt and some of the old occupants are still hanging around trying to get out of that fire. Talk about local color. The Old Pink House is one of the city’s best restaurants with shrimp and grits so delish it makes a grown man cry. But in spite of the incredible food things have not always been wonderful. James Habersham Jr. built the house in the 1700s and hung himself there because he was distraught over his wife’s death. That’s terrible for sure but what is even worse is that he hasn’t left. Servers say Habersham is a bit of a neat freak and likes to straighten table settings and put chairs in their proper place. And he’s not alone, his whole clan still hangs around. His kids like to lock ladies in the downstairs bathroom. Like I said, you may not believe in ghosts but I bet if you got locked in the bathroom you’d be a believer. Then there’s the 17hundred90 Inn, the oldest inn in Savannah. In the 1700s Anna Powers fell in love with an English sailor while staying at the inn. They married but something went wrong and Anna jumped to her death from room 204. Couples staying in that room write down their experiences…and I’m not talking amorous experiences…in a notebook on the bedside table. If you manage to make it through the night you celebrate with a peach martini. Personally I’d be on Prozac. Then there’s the Kehoe House that is now a B&B. In the 1800s twins died while playing in one of the house's massive chimneys and guests who stay in rooms 201 and 203 still hear the kids playing. I’ve stayed at the Marshall House. It was used as a Union Hospital during the unfortunate Northern Aggression. When they were rehabbing the place bones were found in the basement where they did the amputations. While there our cell phone would go off in the middle of the night, the keycard worked then didn’t and the clock alarm sounded and none of us set it. No one really knows for sure what’s going on in Savannah but something is afoot. I love the city and it’s the perfect backdrop for tooling around in a ’57 red Chevy convertible, walking Bruce Willis…the other Bruce Willis…in the parks, eating sandwiches at Parkers or Zunzies and having drinks at Abe’s on Lincoln. So you see, this is why Savannah is a great city for murder mysteries. It’s has tons of history and a lot of dead people already there. Hope you get a chance to visit and check this all out for yourself. While others girls dreamed of dating Brad Pitt, Duffy Brown longed to take Sherlock Holmes to the prom. Today she conjures up who-done-it stories for Berkley Prime Crime and has two series, the national bestselling Consignment Shop mysteries set in Savannah and the Cycle Path Mysteries on Mackinac Island. Geared for the Grave the first book in the Cycle Path series is a December, 2014 release. Duffy wrote romance as Dianne Castell for Harlequin and Kensington and is a USA Today Bestselling author. 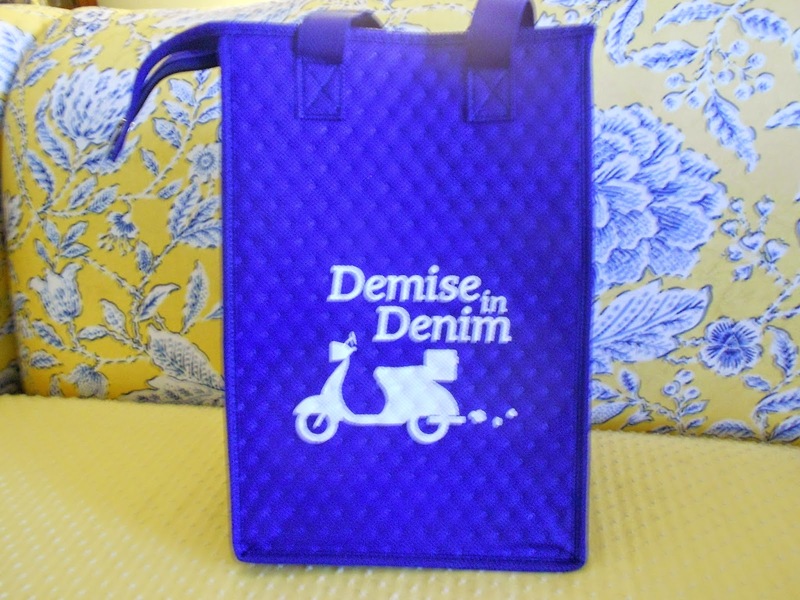 To celebrate the release of Demise in Denim, Duffy is giving away a Demise in Denim lunch tote to two MRM readers! Please comment below to enter the giveaway! Share this post on social media for a second entry; just comment and let us know you did so. Please Note: If you are commenting anonymously, please leave your full Facebook name or email address so that we may contact you in case you win! Contest is open to US residents only. Winners will be chosen via random number generator at noon EST on Tuesday, April 14th! I'm sending your post to my kids who just moved to Savanna. I'm sure they'll enjoy the colorful history! I loved your post. It makes me want to visit Savannah even more! It is a great place to visit. The MRM clan has had fun there. Hi Nancy. It’s a great place for a vacation! True South. Lovely homes and the food is incredible. I love this series! Thank you for the giveaway. Thanks so much, Deb. I really appreciate it. I love this series very much. Thank you for the chance. Love these books!!! I shared on Facebook and Twitter. Thanks for the giveaway!!!! Savannah is one place I have yet to visit. It sounds fascinating and it's definitely on my travel list. Meanwhile, I've added the Consignment Shop mystery series to my book list! Thanks for the post! I would love to visit in person, but at least I can visit in books. Thanks for all the spooky details. Thank you for stopping by, and good luck with the new book!! Sounds like an interesting place to visit. Thanks for the chance. Shared on FB. Barbara Hawk. Duffy: How come this contest is only for Americans? Why are your Canadian fans excluded from this wonderful draw?? I want a chance to win a lunchbag too.